Addon Advice – Be Wary Of 3rd Pary Addons! When it comes to browsers Firefox is by far the superior contender amongst all others. Not only is it faster and has superior user features, but it has a significant amount of additional features that can be added. 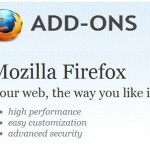 These extra features are called add ons and are created both by Firefox and by other users that aren’t affiliated with Mozilla. With the high popularity in these … [Read more...] about Addon Advice – Be Wary Of 3rd Pary Addons!